What Causes Foot Pain When Jumping Rope? Jumping rope is one of the best exercises you can do. It builds cardio endurance, agility and strengthens the calf and supporting muscles to allow you to stay on your toes. Being able to stay on your toes is really important for boxing. This is why jumping rope is such a staple exercise for the sport. 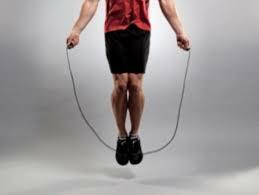 Though jumping rope has a number of benefits some people report having pain in their arches when jumping. This is not uncommon and there are a couple of things that could be happening. Sometimes the arches of the feet may drop because the foot has not been trained to support weight properly. The act of moving around on one’s toes is not a natural movement that people tend to do when not engaged in an athletic activity. If this seems to be the issue, then making sure to rest and stretch in between jump rope workouts is important. Start with short periods of jumping as your feet catch up. There is no right or wrong answer when it comes to the concept of wearing shoes or jumping rope barefoot. Ideally, you should be able to do either depending on the surface of the floor. If you are jumping on concrete put some shoes on. If you are training on a padded mat, you probably don’t need them. When this starts to get specific to the individual jumper is if you find yourself having pain when jumping. Again, this is usually in the arches. If you are a shoe-wearer, the first step would be to re-evaluate your shoes. Specifically your insoles. You may need additional arch support to jump comfortably. Adversely, you may want to try jumping barefoot if you are on a padded surface. Both corrections stem from the concept of changing the level of support on your arches. For those that typically go barefoot, it may be beneficial to try wearing shoes. The important part is the insole. If you can get custom insoles made, that is ideal. No two feet are exactly the same. Not even your two. This is a much more serious situation and will require medical treatment. Plantar fasciitis refers to inflammation of the arch-supporting ligaments that extend from the heel to the back of the foot. This pain is usually targeted more in the heel rather than the arches. According to The Feet For Life Podiatry Center, more than 95% of heel pain is caused by plantar fasciitis. This is not something you want to just work through. Yes, there is good form and bad form in jumping rope. Just because you aren’t stubbing your toe every 10 jumps does not mean your form is correct. Here are some tips on how to perfect your form through balance and weight distribution. Weight should be evenly distributed around outside of foot and toes. Imagine a tripod of support from your heel to pinky and big toes. Lacrosse Ball – Foam rolling and myofascial release are important for muscle recovery and this does not exclude feet. Sit on a chair with your feet on the ground. Put the lacrosse ball under your foot and apply enough pressure to stretch the muscles and fascia in the foot. Towel Stretch– Sit on the ground with your feet straight out in front of you. Place a towel around your toes and pull the towel back toward your body, stretching the feet. Move the towel lower or higher on the foot to change the stretch. In the position focus on stretching your feet by lowering your heels to the ground to achieve a stretch and then raising up to your toes. You can also pedal your feet to achieve a stretch.